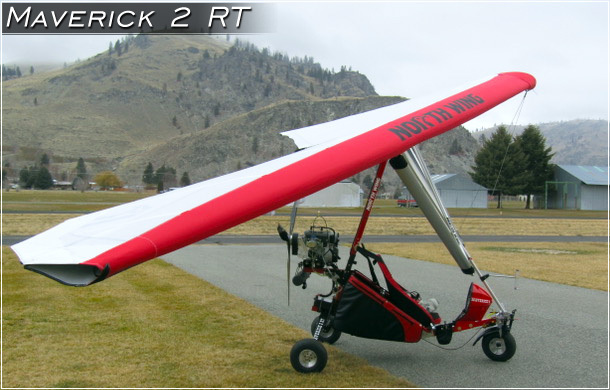 Maverick 2 RT ultralight trike Video · Watch the Maverick 2 RT and Maverick 3 wing take-off and fly-by. 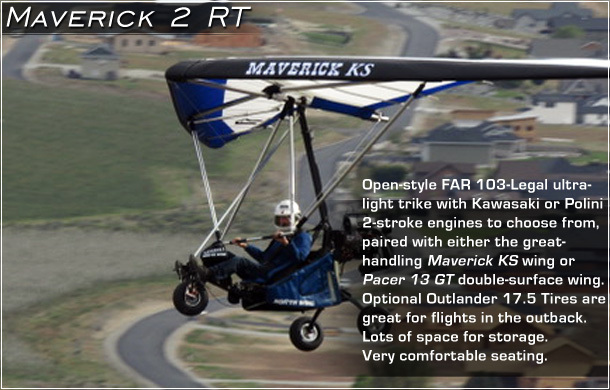 The Maverick 2 RT Ultralight Trike is the result of years of ultralight trike design refinement. 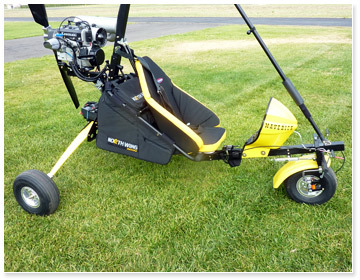 The design of both the trike and the wing has been enhanced to include features that benefit flight performance, improve set-up convenience, add storage space, and more. The Maverick 2 is a "state of the art", highly refined low profile single-place trike. This trike comes in two choices for you: the Maverick 2 RT (no fairing) and Maverick 2 Legend (streamlined fairing). We are proud of our extremely comfortable seating, a must for long flights. High ground clearance is another terrific feature for off-field landings. The Maverick 2 trike frame has been extended to maximize storage space behind the pilot, enable additional fuel storage, camping equipment, and anything that fits in the space and maintains acceptable weight limits. We also changed the folding design of the trike mast, so only the mast pivots just above the seat rail and now includes a spring-assisted mast, as our two-place light sport aircraft have. 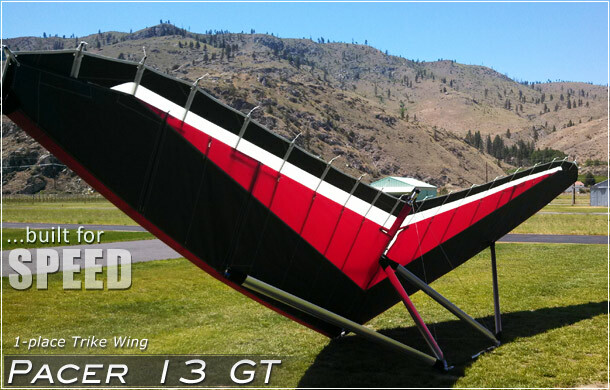 The spring-assisted mast on the Maverick 2 reduces the effort required to lift the wing into position, reducing the effort from lifting 83 lbs of wing to only 15 lbs! View more Maverick 2 RT photos in the Photo Gallery. 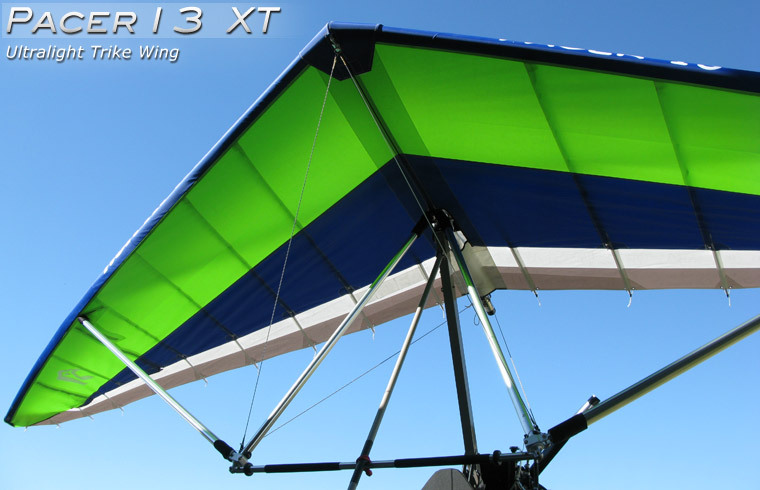 The Maverick 3 Wing also has been improved, featuring new strutted airframe components. We have increased the load rating of the wing, from 550 gross to 650 gross by a new airframe. The increased load rating is especially helpful for pilots who like to fly on floats. The Maverick 3 wing has another feature for convenient travel or storage, the ability for the wing to fold back while attached to the trike. 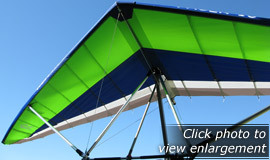 Refer to the photos for examples of the new improvements on the Maverick 2, the perfect single-place ultralight from North Wing. 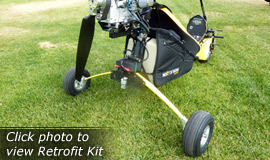 We use only aircraft grade aluminum tubing throughout the trike frame. 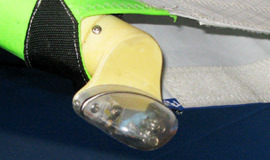 Aircraft hardware and fasteners are also used on the Maverick 2. The rear suspension uses a strong fiberglass pultruded axle with drag struts. If you like to have a hand at building part of your trike, you may purchase the Maverick 2 trike and wing without the engine, propeller or gauges. » Rugged suspension with high ground clearance. The Maverick 2 RT is powered by the 40HP Kawasaki 440 2-stroke engine, lightweight and powerful. 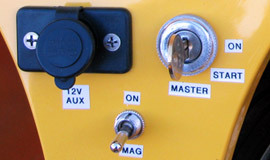 Add the optional Electric Start for easy engine starting. Click here to view the optional 35HP Verner JCV-360 4-stroke. Click here to view the standard 40HP Kawasaki 440 2-stroke. 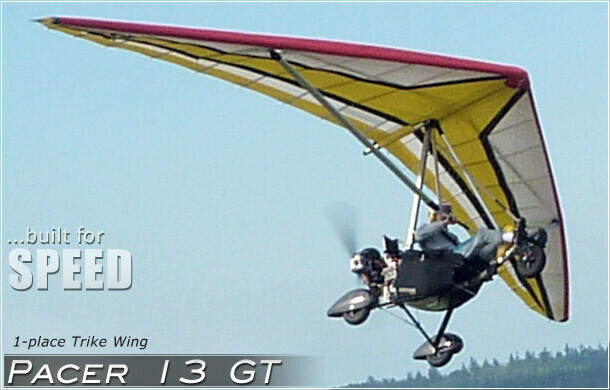 The Maverick 3 wing is standard equipment, featuring a strutted airframe that is very strong. We have increased the load rating of the wing, from 550 gross to 650 gross by a new airframe. 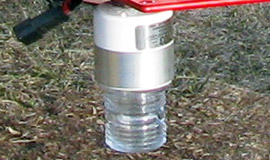 The increased load rating is especially helpful for pilots who like to fly on floats. The Maverick 3 wing has another feature for convenient travel or storage, the ability for the wing to fold back while attached to the trike. The Maverick 2 RT has a very strong rear suspension, and uses a strong fiberglass pultruded axle with drag struts. High ground clearance is another terrific feature for off-field landings. The Maverick 2 RT has a convenient Pull Start located directly above the seat, making in-flight re-starts an easy effort. For additional engine-start convenience with the Kawasaki 440 engine, add the optional Electric Start. 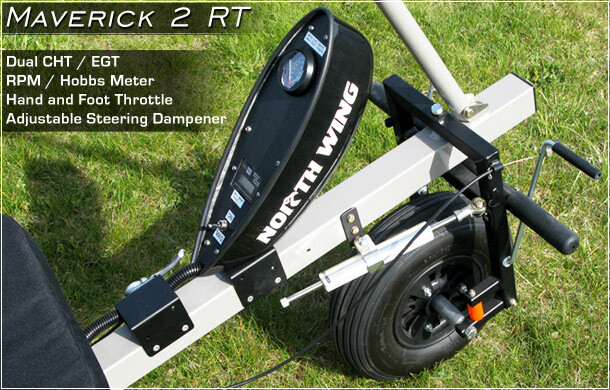 The Maverick 2 RT comes with a 68" IVO propeller as standard equipment. 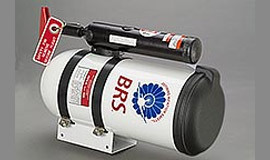 An RPM / Hobbs Meter and Dual CHT / EGT Gauges come as standard equipment. The Maverick 2 RT Instrument Pod has room for additional gauges and switches. 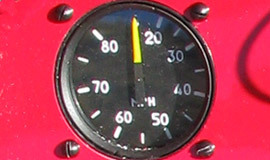 Consider adding the optional EIS Gauge and Airspeed Gauge for additional important flight information. Instrument Pod color choices include Red, Yellow, Black, White, or talk to us about a custom color. The comfortable Seat on the Maverick 2 RT secures the pilot with a 4-point Seat Belt Harness. You will appreciate the comfort of the seat during long flights. The Maverick 2 RT includes a Saddle Bag on each side of the trike, including two zippered pockets for storage. A third bag is located behind the seat, with a zippered pocket. 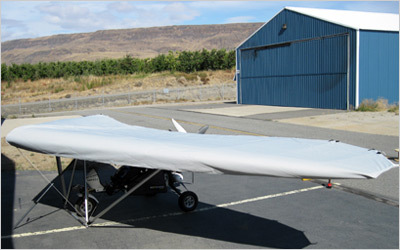 The spring-assisted mast on the Maverick 2 reduces the effort required to lift the wing into position, reducing the effort from lifting 83 lbs of wing to only 15 lbs! 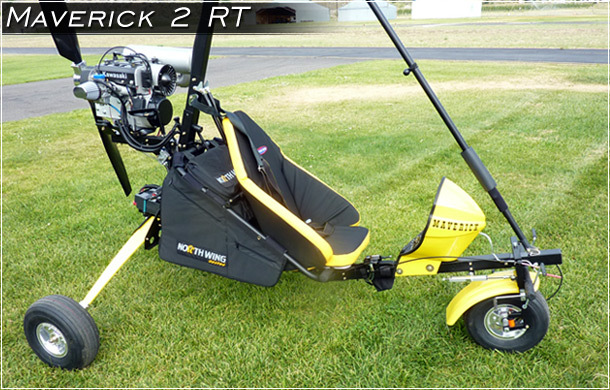 The Maverick 2 RT includes both a Hand and Foot Throttle. The adjustable Steering Dampener is especially helpful for reducing front-wheel "shimmy" during fast or cross-wind landings. The Maverick 2 RT includes strong and lightweight 6" Nylon Mag Wheels that are corrosion proof and solvent resistant, with a Front Drum Brake. 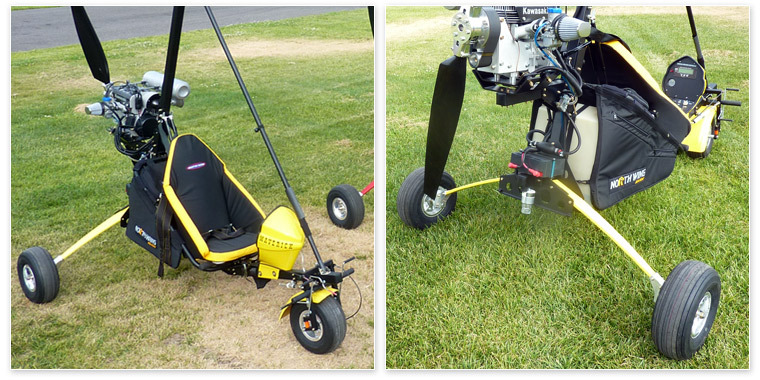 For flights in the outback away from the runway, add the Turf Tires to your Maverick 2 RT for additional traction. The Maverick 2 RT includes 5-gallon Fuel Tank with Fuel Primer located beneath the seat, featuring a new streamlined design with an easy-fill top, easily adapted for a Fuel Gauge. Both are conveniently located at the rear, beneath the seat. The Pacer 13 GT flys trim at 50 to 60 mph and has a top-end cruise speed of 65 mph, making it great for X-C flying. The number one advantage of the Pacer wing is that it cuts through rough air like a knife, reducing pilot fatigue. We have also found that the Pacer takes off with only 20 to 30 feet of extra roll. Click here to view more information about the Pacer 13 GT. Softer landings, less drag, less fuel consumption, aircraft styling! You can upgrade your older Maverick 1 or Maverick 2 trike to our new Leaf-Spring Suspension with our Retrofit Kit. This strong new 7075 Aluminum landing gear also folds for storage and travel. Click here to view the Maverick Leaf Spring Suspension - Retrofit Kit. 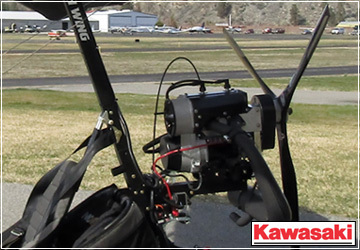 Make in-flight starts even easier with the convenient Electric Start option for the Kawasaki 440 engine. 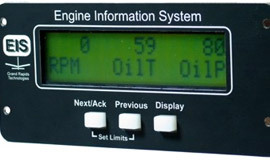 Monitor essential engine functions and more with the Engine Information System. Add the optional Airspeed Indicator to stay aware of flight speeds during take-off, cruise, and landings for added safety and fuel economy. • Mounts to rear of trike. Reduce drag and enhance fuel economy even more with the Streamlined Wheel Fairings for the Maverick 2 RT Trike. Available in red, yellow, black, white. Custom colors available upon request. 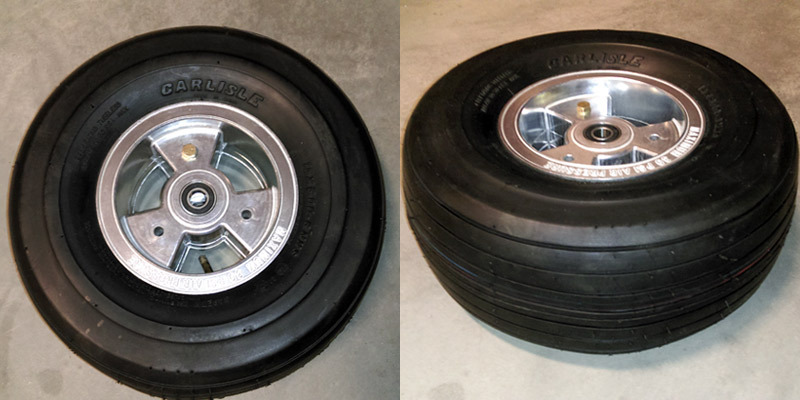 Turf Tires for the Maverick 2 RT trike are especially helpful when landing on grass or other surfaces during flights in the outback. Aluminum rims add strength and are lightweight. 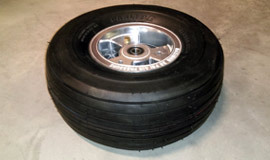 Carlisle 600x6x15 tires. Click here to view an enlargement of the Turf Tire photo. Improve your visibility among traffic during early morning and evening flights for added safety! Consider this important safety option when you order a new trike. 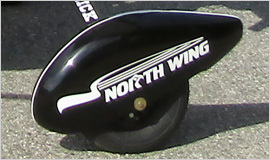 Protect your trike wing from snow, rain, dust and especially UV when it is set-up with the North Wing Wing Cover.